We spent just a few hours at Abu Simbel but it was more than enough to convince us that Egypt’s monuments and temples are legitimately world renowned. Eager to see more, we hopped on an early morning train from Aswan to Luxor, the “world’s greatest open air museum.” After dropping off our bags at the hotel, we covered ourselves in sunscreen, grabbed our hats and headed out into the scorching sun. Our first stop was Karnak Temple, the largest ancient religious sight in the world. 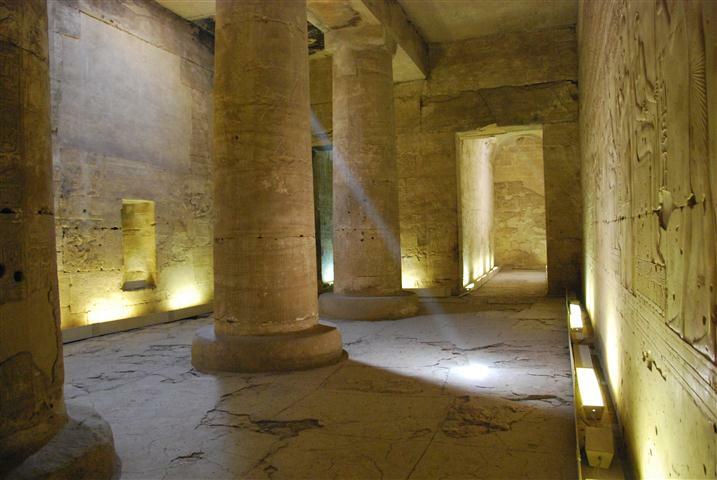 This incredible complex turned out to be one of our favorite sights in Egypt. Over the course of thousands of years 30 pharaohs contributed to Karnak’s construction, making it Egypt’s most complex and diverse temple. Standing in line to buy tickets, we were approached by a man offering to be our tour guide. Sensing our hesitation, he proposed that we listen to his introduction and continue on without him if unsatisfied. We quickly realized that he knew his stuff and proceeded to spend the next 90 minutes listening to him uncover the secrets of Karnak. The temple’s most impressive feature is Hypostyle Hall which contains 134 columns, some up to 80 feet tall, depicting hieroglyphs and scenes from Egyptian mythology. After finishing our tour we wandered back to this massive room, giving ourselves more time to appreciate our surroundings and admire the sheer scale of the columns. 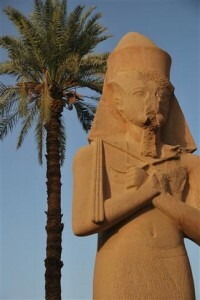 Portions of our time in Luxor are a bit cloudy due to a case of food poisoning that struck us both. After traveling for seven months this was bound to happen eventually. Fortunately our hotel was clean, comfortable and air conditioned and the Australian owner did her best to ensure we got plenty of liquids. We bounced back from our illness quickly and were once again ready to fight the crowds and heat. Over the course of two days, we visited the Valley of the Kings, the Valley of the Queens, Medinat Habu, Deir el-Bahri , Abydos and Dendara. Nearly everyone has seen photos of these places in history books or National Geographic but seeing them in person is an infinitely better experience that I find difficult to describe. 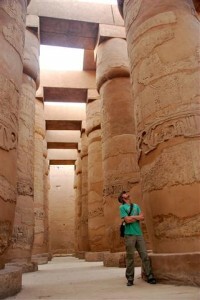 At Abydos and Dendara, we pretty much had the temples to ourselves. It felt surreal to stand alone in the stone rooms with rays of sun shining through open shafts in the ceiling while examining carvings that have somehow survived thousands of years. Our visit to the Valley of the Kings was not nearly as intimate (an average of 4,000 to 7,000 tourists visit each day) but it was still one of our favorite sights. Carved into the mountainous desert terrain are tombs that were elaborately constructed for some of Egypt’s most important rulers. The majority of the tombs are hidden deep in the earth and from the outside are indistinguishable from the surrounding landscape. However, once we entered the doors and descended down a rock-cut corridor, we were transported to a different world. The walls are covered in surprisingly colorful bas-reliefs depicting the life of the Pharaoh once buried within. Each of the tombs we visited contained three rooms with the last being the burial chamber of the Pharaoh. Unfortunately, visitors are unable to bring cameras inside the tombs so we have no pictures to help us remember our visit to this magical place. A real history buff could spend weeks exploring Luxor and the surrounding area but we grew weary of sightseeing and decided the pyramids near Cairo would be our last stop before hitting the Red Sea. Although the Great Pyramids of Giza are probably the country’s most famous monument, they rank at the bottom of our list of must see sights in Egypt. Contrary to what many people think, they are not in the middle of the desert. In fact, they’re found in the suburb of Giza, just 30 minutes from the chaos and pollution of downtown Cairo. Across the street from the admission gate is a Pizza Hut…seriously. it’s not that we disliked the pyramids, we just felt they were much less impressive than the other places we saw in Egypt. Unlike many of the temples, there are no carvings or bas-reliefs to admire and thus not a lot to see. We probably could have been in and out in one hour but we stayed longer almost because we felt like we should. 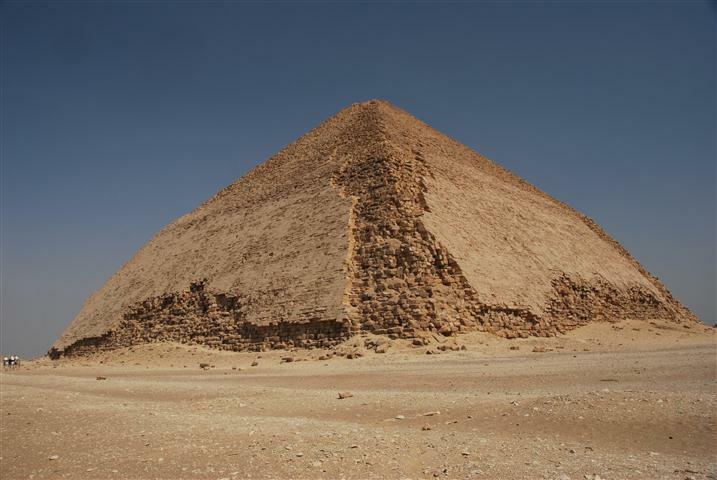 What surprised us most about the pyramids was their rough outer layer. The smooth bricks that once covered these massive structures was long ago removed by industrious workers in search of building materials. Probably the most frustrating thing about our visit to the Great Pyramids was the endless stream of tourists, and countless touts selling souvenirs and camel or horse rides. Desperate for a quieter experience, we high tailed it out of Giza and headed to the pyramids at Saqqara and Dahshur. 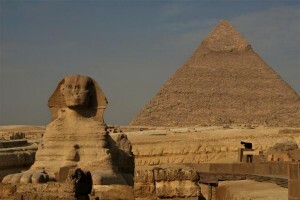 Located a bit further from Cairo, they felt worlds away from the chaos at Giza. Tour buses and touts were noticeably absent and we actually had a chance to sit back, contemplate the extraordinary structures and appreciate just how impressive they truly are. Overall, our time in Egypt was much more enjoyable than anticipated. Most of the sights we visited were incredibly impressive and nearly all of the Egyptians we interacted with were very friendly. Contrary to what many other travelers led us to believe, the touts were not all that aggressive. 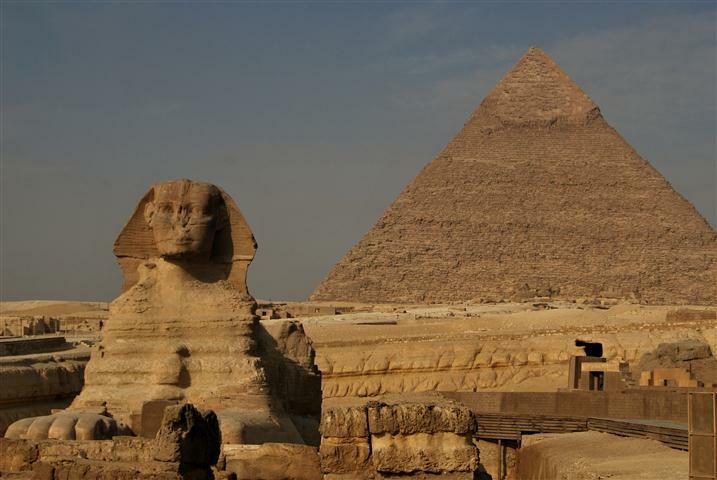 It’s possible that we entered Egypt with a completely different perspective simply because we had been traveling awhile and like to believe that we are pretty adept at avoiding scams. Either way, we didn’t feel like we were hassled anymore than in many other places. For us, the downsides of Egypt were the extreme heat, the mediocre food and the never-ending stream of tourists at most major sights. Even the Cairo Museum was packed with so many large tour groups that we found it difficult to move. After more than half a year on the road, this was a first for us. Choosing sanity over elbowing our way through hoards of people, we made a dash for the King Tut exhibit. 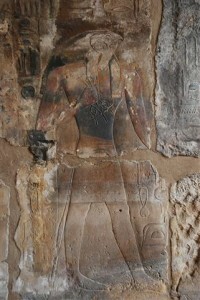 Fortunately, being able to see his elaborate mask and the treasures from his tomb made the trip worthwhile. Wiping the sweat from our brows, we descended the steps of Cairo Museum and struggled to make our way through a large crowd of people and bumper to bumper traffic. Although many of Egypt’s ancient sights more than exceeded our expectations we were in desperate need of a break and couldn’t think of anything more refreshing than five days of scuba diving in the Red Sea. 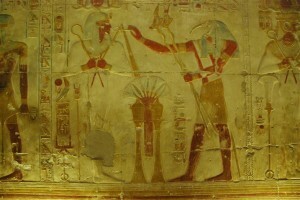 This entry was posted on Wednesday, March 9th, 2011 at 3:01 pm	and is filed under Egypt. You can follow any responses to this entry through the RSS 2.0 feed. You can leave a response, or trackback from your own site.